A study of the 1300 works created by the artist and the exhibitions organised around his work have allowed us to distinguish the different characteristics which mark quite separate modes of expression. These different stages follow the artist's career chronologically, and are characterised by evolving styles. In the 19th century, the School of Fine Arts (l'école des Beaux Arts in Paris) trained its students by getting them to analyse the reality of their 3-dimensional representations (surface anatomy, the study of drapery, the study of different facial expressions, and mythological or religious subjects). 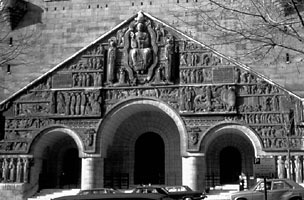 In this composition, Bouchard showed in both high and low relief that he had really assimilated academic teaching. The expressive heads of Oedipus, the old blind man, and of Antigone, his daughter, with a soft and compassionate face. 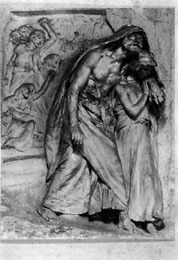 The treatment of drapery, the naked torso of the old man and the supple arms of the young girl, the composition of different spaces, contrasting the foreground in high relief and the background in low relief, and the changes of scale. The Villa Médicis in Rome obliged its residents to send to Paris each year one work referring either to Antiquity or to the Renaissance. The artist was passionately interested in the subjects around him, and studied the peasants of the Roman Campagna, Arabs from North Africa, Spanish dancers and workers. In his second year, he sent a realist work which was badly received by the members of the Academy of Fine Arts (the anatomy was obscured by the clothes), but finally accepted because of its fine sculptural quality. The studies realised in this period are characterised by very strong realism, which limits itself to clearly defined details. He represents a personage, the medieval architect of the Sainte Chapelle and Abbey of Saint Denis (just north of Paris). 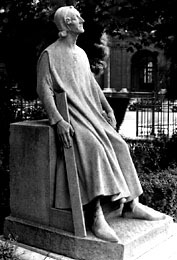 Seated on the base of a column at his work-site, with a ruler and compass in his hand, his gaze tending upwards toward his architectural work. The treatment of the lower parts with simple planes, large pleats in the draperies, directs our attention towards the more detailed face. The search for simplification is quite clear here, Bouchard wrote to one of his friends : "I have finished my Pierre de Montereau, it is a curious statue, but so simple that it appears poor and I feel convinced that it will not have any success." Exhibited at the Grand Palais (Paris) in 1908 during the Salon of French Artists, it was, on the contrary, an immediate success. In 1909, the artist continued his search for simple forms on a more massive scale. "... to speak of only the essential and to talk of it with all possible truth, to attain at the same time the 3-dimensional beauty of the planes, the volumes and the silhouettes are my present objectives." 1911, The search for monumentality and simplification. "... It is not only the costume, but also the search for the planes which hold the light or allow it to run across them, the beauty of the volumes, the quality of the accents. Indeed, everything which creates the language for us as sculptors, which we have forgotten and which the fine image makers of the medieval period can re-awaken in us through their beauteous works, despite the apparent aspect of ugliness." In his wish to simplify, he sought the Decorative approach. 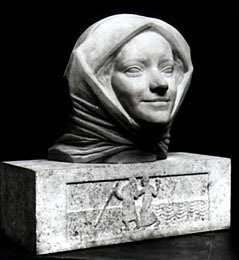 "My researches are thus moving more and more towards the decorative art of modelling, looking for the architectural side in its construction, its volumes, its decoration and the relationship of the planes that create whatever subject is to be expressed and generating an interest for both the eye and the spirit of the viewer." He followed, through numerous commissioned works, his research into the Decorative. His style, although remaining very decorative, nevertheless contained less geometrical aspects and more curves, with his personages adopting more supple attitudes. The Second World War interrupted Bouchard's research. He had fewer commissions, and returned to subjects relating to his native Burgundy. He went back to a decorative style that was less geometric, while retaining his sculptural conception using large, simple planes. Towards 1950 when Bouchard was 75 years old, perhaps as a reaction against the new generation which tended towards abstraction, Bouchard returned to a more simplified realism.